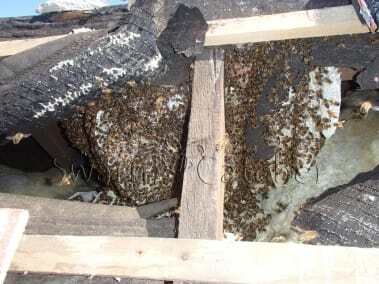 Honey bees in roof spaces. 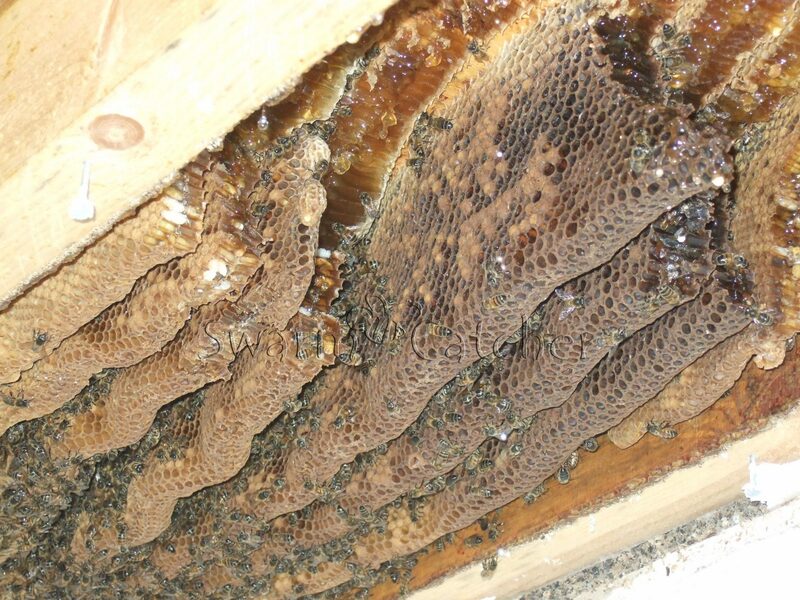 Honey bees in roof spaces are not nearly as common as you might expect, in fact we don’t come across honey bees in roof spaces that often. Generally honey bees don’t colonise roofs, when they are flying in beneath tiles they more often than not are colonising a cavity wall or an old dismantled chimney stack that is hidden beneath the tiles or possibly a soffit. 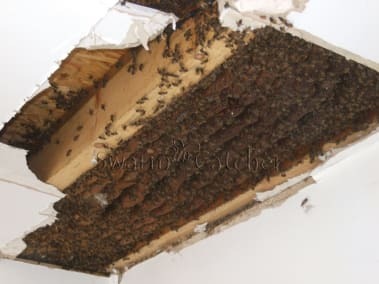 When removing honey bees in roof spaces there are two main options, either get to the honey bee nest from outside thru the roof, or from the inside thru the ceiling. 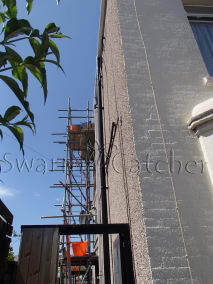 Obviously where practical it is better to access from the outside by removing slates or tiles and cutting through the membrane (which is often in poor condition in these scenarios). 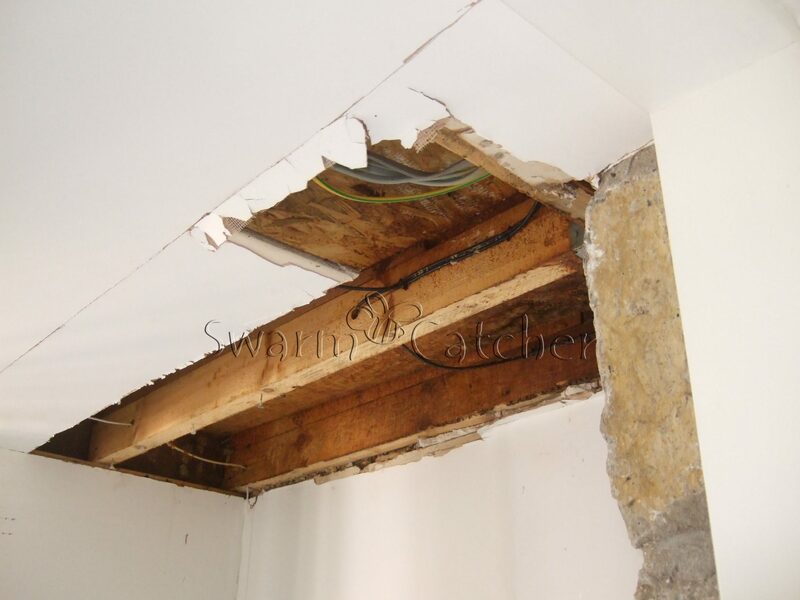 Reinstatement of this is usually a lot more straight forward and less intrusive than if one has to access thru the ceiling plasterboard. 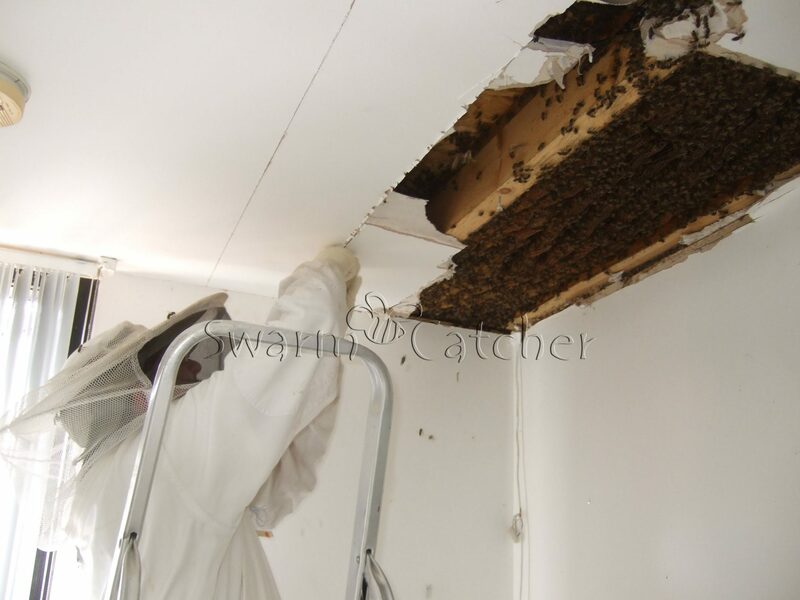 Where possible this is our preferred method temporarily removing the roof slates or tiles which then allows us to reach in and remove all of the wax and honey stores and to relocate the honey bees. Its usually far easier and certainly a lot more comfortable doing this rather than trying to work above your head in a hot warm wearing a bee suit. 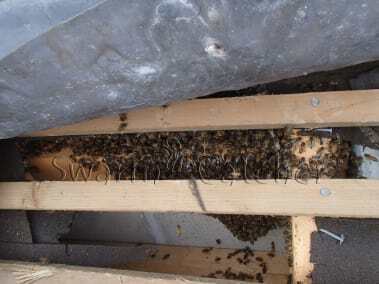 Removing honey bees in roof sounds straightforward, but its not necessarily so, but the good news is that we haven’t been beaten yet. Before reinstating the slates or tiles we will clean up the area scraping of the honey and wax residue as much as possible. 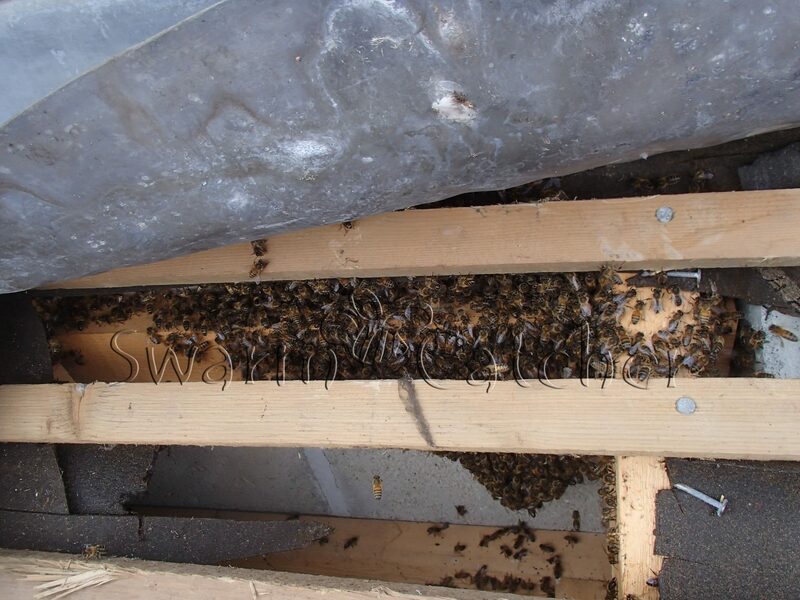 We will if appropriate spray the area with something to mask the residue and if appropriate fill the space so that it can not be reoccupied by another swarm. We will discuss these options with you especially in reference to causing any breaches in the insulation gap and the consequences of bridging any air gaps. We highly recommend against doing anything that could create additional damp problems in the future. 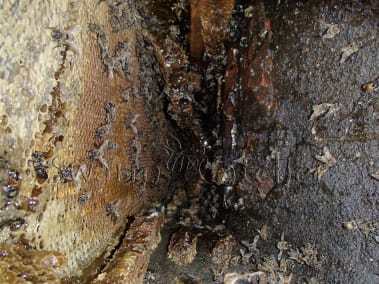 We are not experts on this subject and always recommend discussing it with professionals. 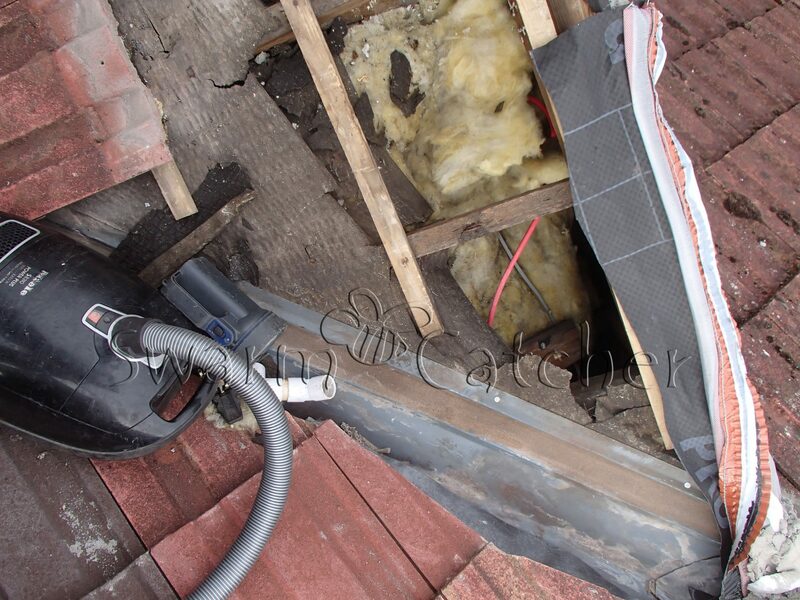 We regularly come across people that have damp problems as a result of carrying out proofing work against pets, we also see it in chimneys when they have been filled with insulating material and are seeing it more and more as a result of firms filling cavities with insulation, which always amazes me as you would have thought that this would have been considered before it was too late. 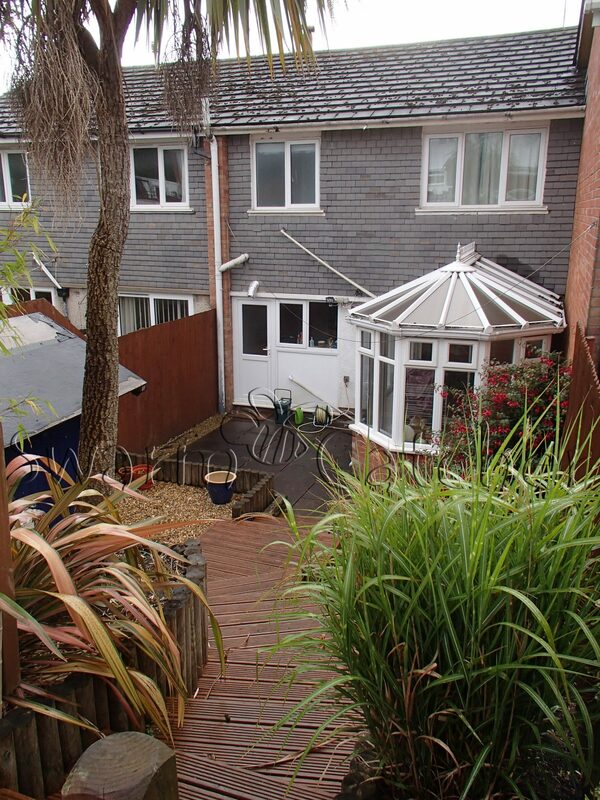 Recolonisation prevention Guarantees for slated or tiled spaces. 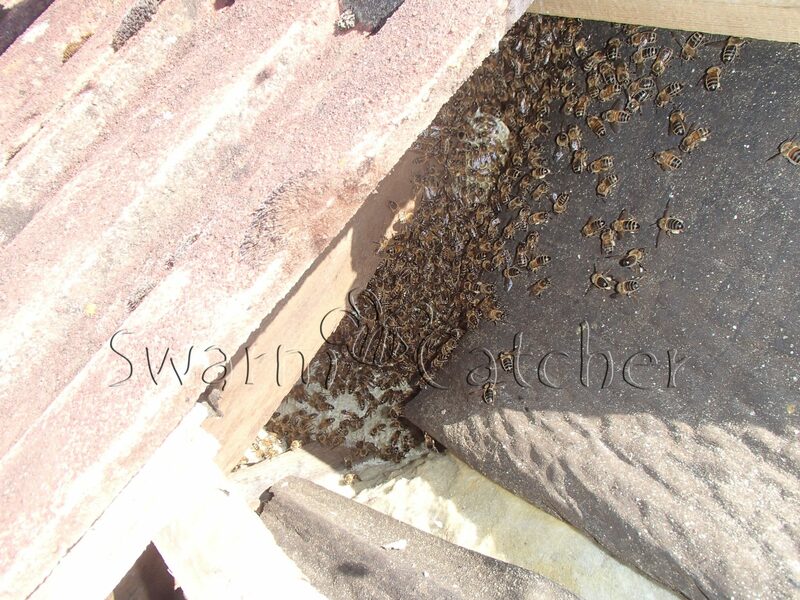 Nobody can offer a proper guarantee that additional swarms won’t in the future recolonise the roof space, if anyone is suggesting that they do then please read it carefully and look at all the get out clauses that are included – you will find its not quite the guarantee you expect. 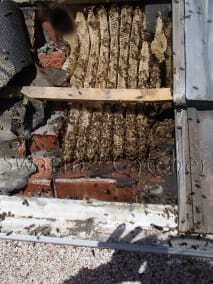 It’s an unrealistic task to seal of a roof space sealing every hole that a bee could enter. The scent from the comb and propolis of the removed bee nest is highly attractive to passing bees, and lasts for years after. 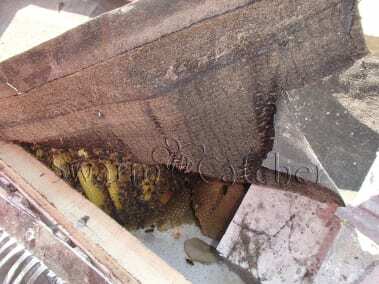 From what we have seen, anyone offering a guarantee is only offering it on the part of the roof that the original colony was in. 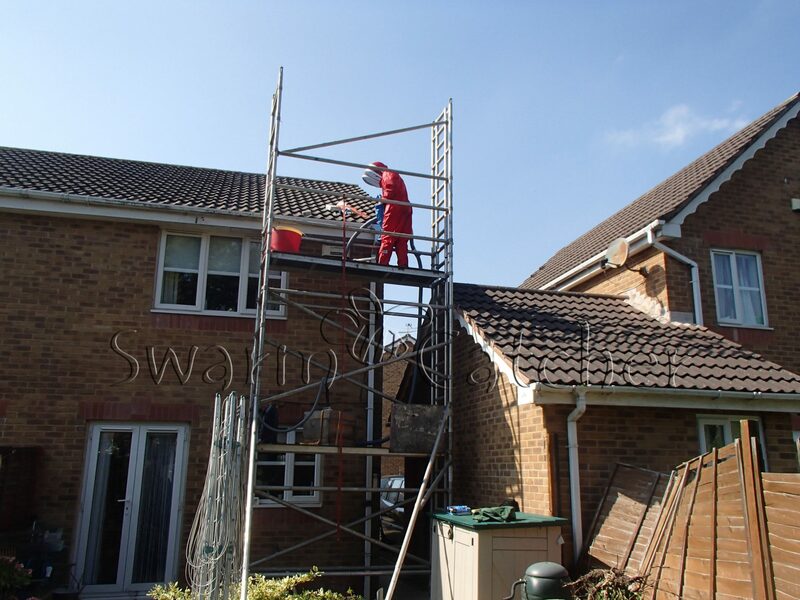 In this situation they fill the space so that it can not be occupied, which we would normally do any way (providing building regulations allow for it). 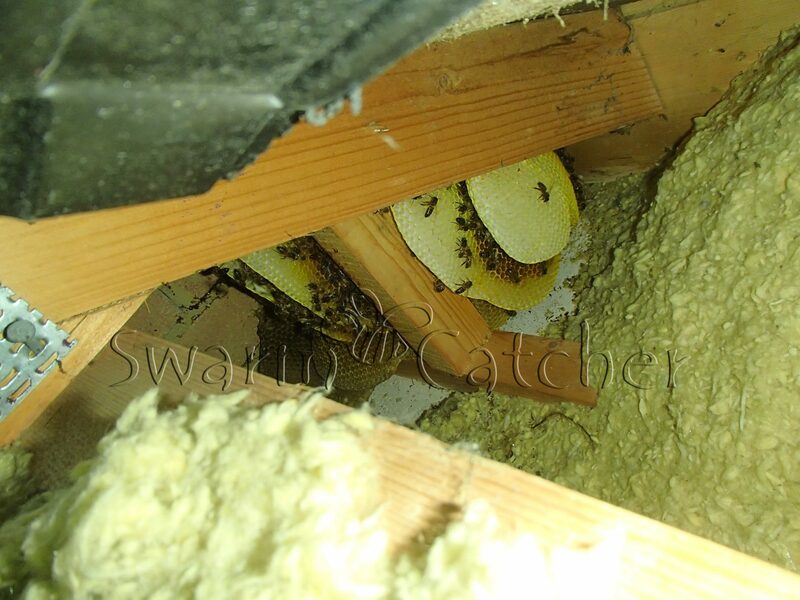 BUT this does not guarantee that the bees won’t occupy the space in the adjoining area between the next set of rafters, which is not covered in any of the guarantees that we are aware of. 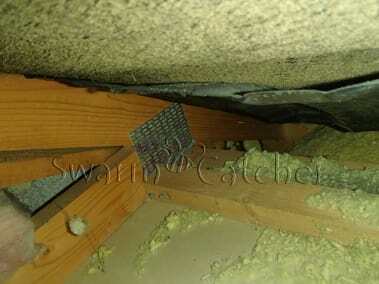 The guarantee is very specific stating only the space previously occupied by the honey bees in the roof is guaranteed. Well they can rest easy on that having filled the space. 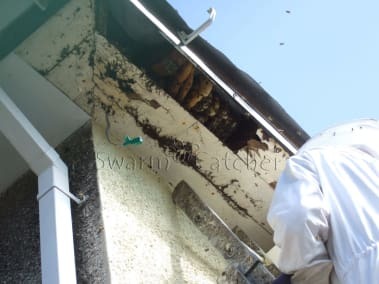 Further more it is only the time spent on removing the bees that is covered, not access, not materials and only after another expensive survey has been purchased. 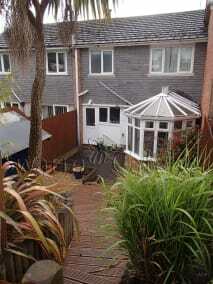 This is an inconsequential guarantee that sounds good but is not worth anything. One of the only ways that could guarantee that any part of the roof won’t be recolonised would be by removing the complete roof, installing insect mesh thru-out, reinstating the roof and filling all gaps after; hardly practical. The good news is that there are a few things that can be done that will go a long way towards the prevention of the honey bees returning, which we can discuss with you. 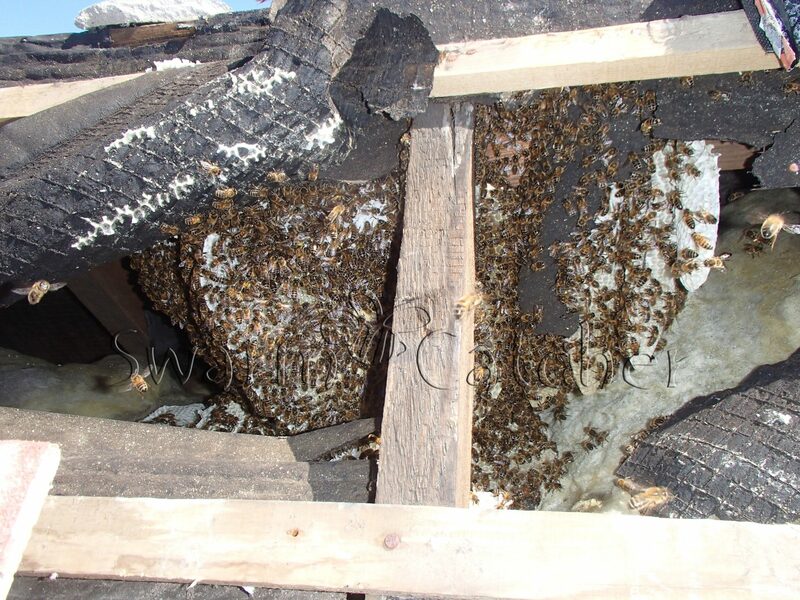 If you have a problem involving honey bees in roof spaces then please give us a call, we don’t charge for the advice and can usually give you an indication of price over the phone if you can provide a few quality photos. 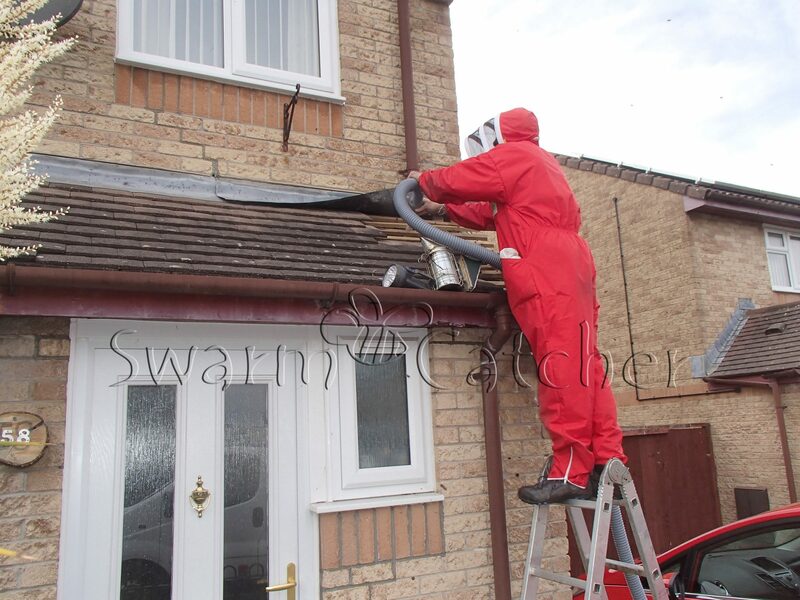 For examples of removal and relocation of honey bees in roof that we have carried out please look at our blog page and do a search using the tag ‘roofs’. 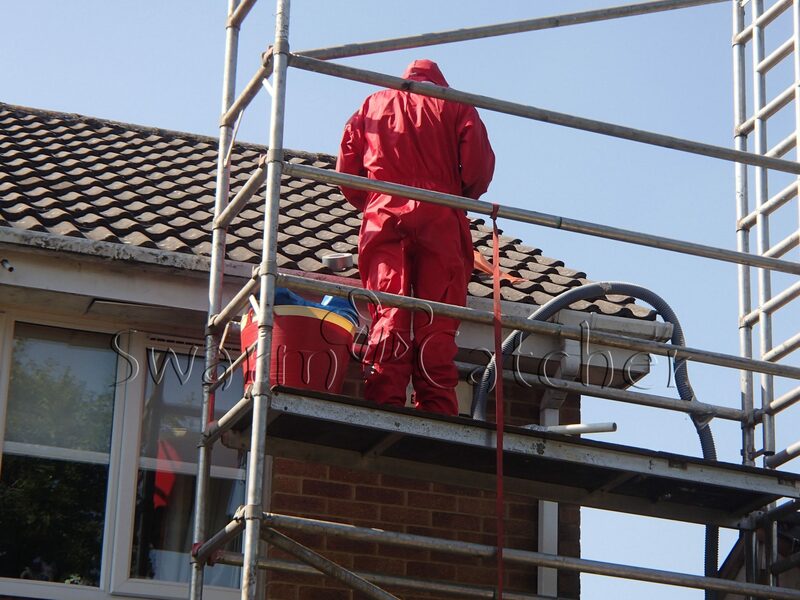 We don’t have details of all the work we have carried out – mainly because I type too slowly, still haven’t figured a good way of dealing with photos on the web site and really have not figured out how to make good videos, but I’m working on all of that too. 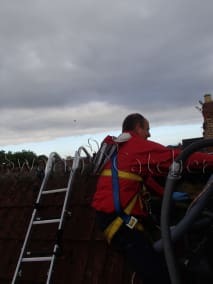 So as time passes more examples will go up, but if there is something particular you would like to see or know please contact me, I’m sure we will have something. 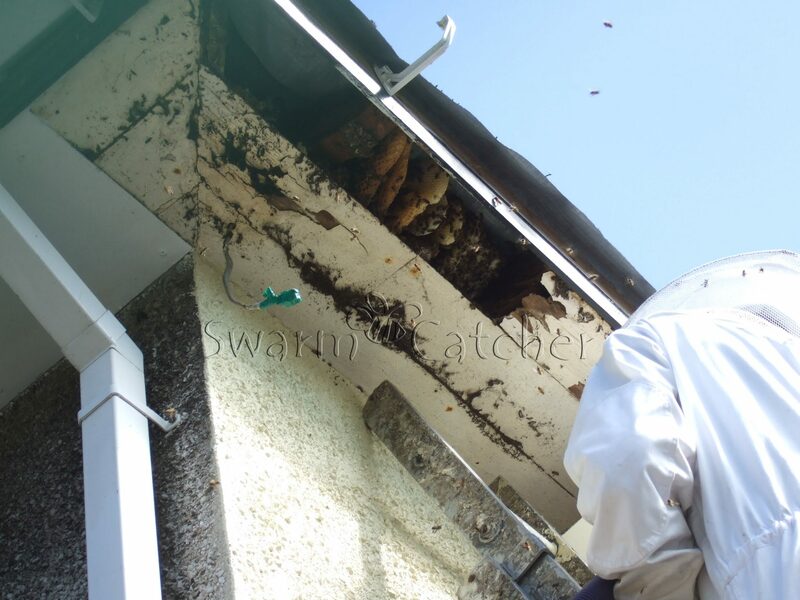 For further information on bee removal and relocation please use the contact form in the side bar or message button below, or CALL 02922 401649 to speak to someone local who knows all about it. Don’t forget a general overview on honey bee removals which can be found at ‘Live honey bee removal‘. 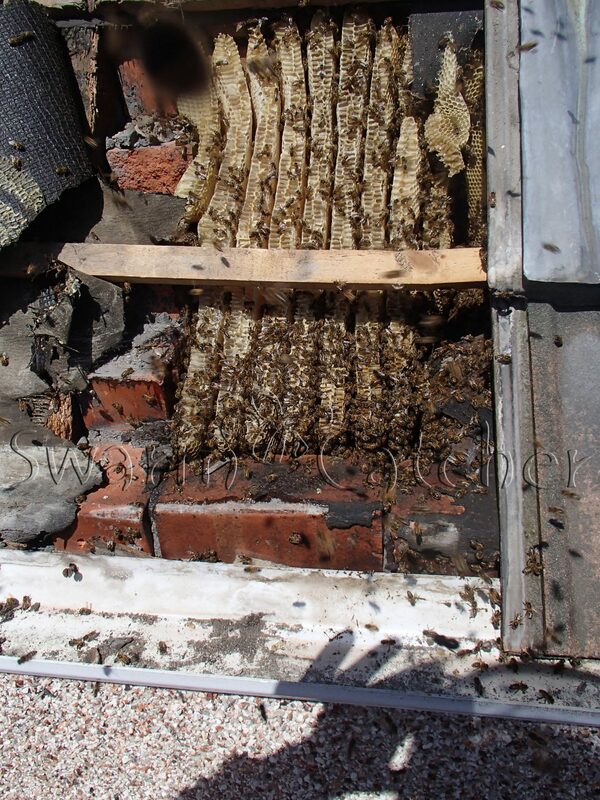 If you are looking for information on removing bees from a chimney check out our article ‘Honey bees in chimney‘, or if you repeatedly have bee swarms take up home in your chimney you may want to look at our page ‘Why honey bees like chimneys‘. Having read that you may want to look at our article ‘Everything you need to consider when removing bees in a chimney‘ which is a fairly extensive overview. 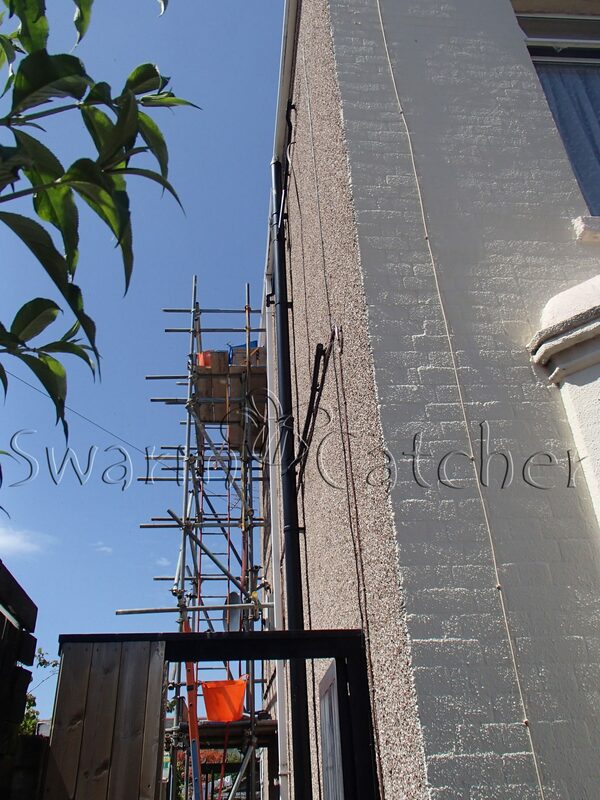 For information on removal and relocation of honey bees in a wall our page ‘Honey bees in wall‘ should be of use. 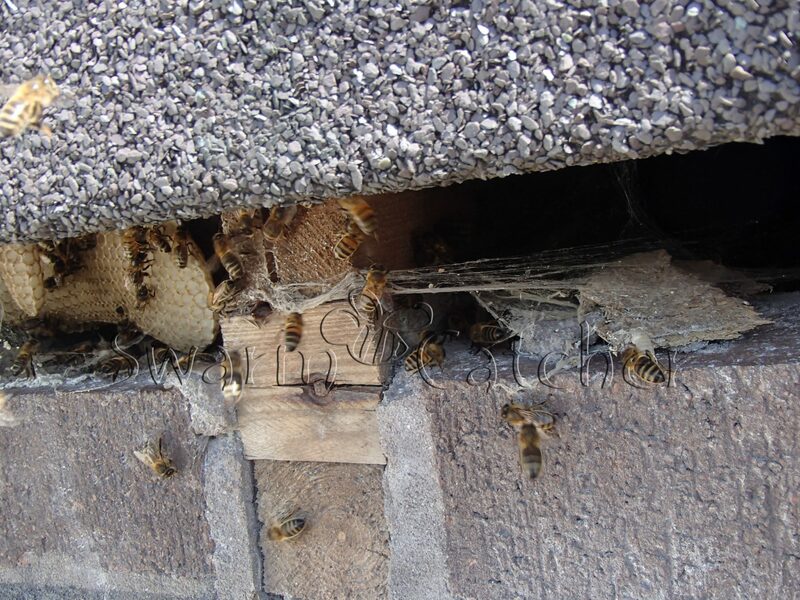 For examples on removals of honey bees from these and other more unusual places check thru our blog page Honey Bee Removal EXPERTS and investigate out Tag cloud too. 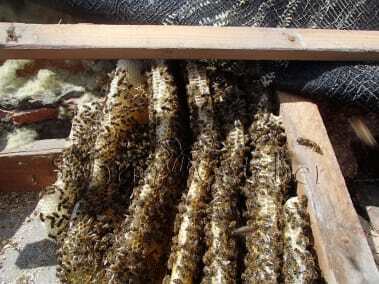 Our honey bee loving Specialist is waiting for you! Your testimonial is greatly appreciated! 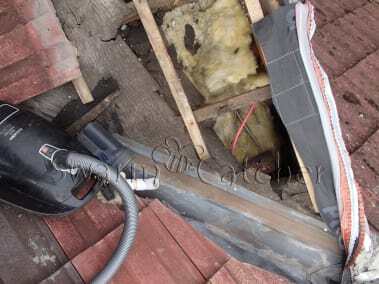 Please leave empty if not applicable. 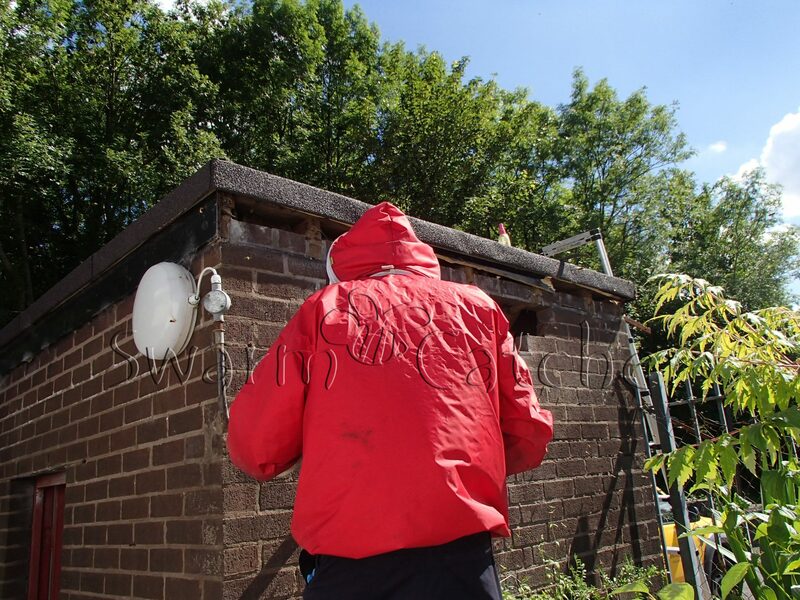 Your feedback would help us evaluate our services.